Where do I begin? Like eternity, this play has no beginning, and no ending. Or maybe it has many beginnings. The pre-show "turn off your cell phone" announcement plays several times, as characters suddenly break out of a scene and demand, let's start over. At times they're in the story, at times acknowledging this is indeed a play. The basic story is that this man called Renner (just Renner) is the man writing the book about the man writing the book... etc. 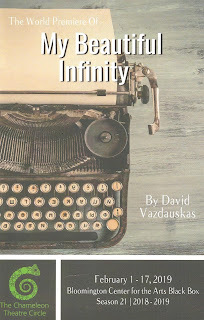 In the story (and maybe in reality), he has created a woman named Eve, a librarian, in order to figure out this thing called love, and its relation to infinity. A man creating a woman to be the partner he wants - gross, right? Don't worry, she calls him out on it and doesn't follow the script, suggesting that maybe she created him. The two other characters, Sarah and George, are at times the book publisher and play director, his parents, and various other characters he writes. We loop around and around and finally end up where we began. Director Scott Gilbert does well with the tricky script, aided by lighting cues (designed by Dietrich Poppen) that help distinguish scenes and realities. 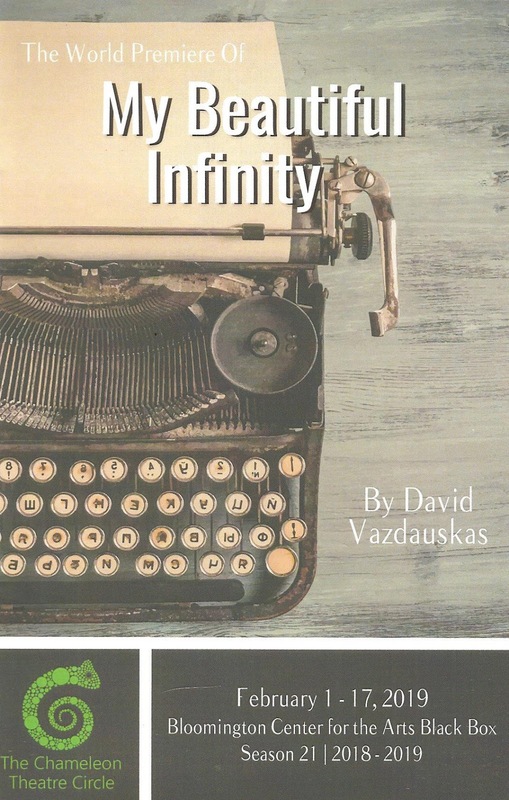 The play fittingly takes place in the round in Bloomington Center for the Arts' black box theater (look for the infinity symbols painted on the floor), with a set (designed by Ursula Bowden) consisting only of four white chairs and a huge heavy writing desk. Or at least it looks heavy, but it's pretty easily moved around the set from scene to scene. The cast also does well with the tricky trippy material, and finds the humanity in the oddball characters. David Wasserman is compelling as Renner as we watch him up-close-and-personal try to figure things out; I particularly loved his science nerd stand-up routine. Eva Gemlo is a good match as Eve, bringing strength and spirit to the role that is more than just Renner's created Eve. 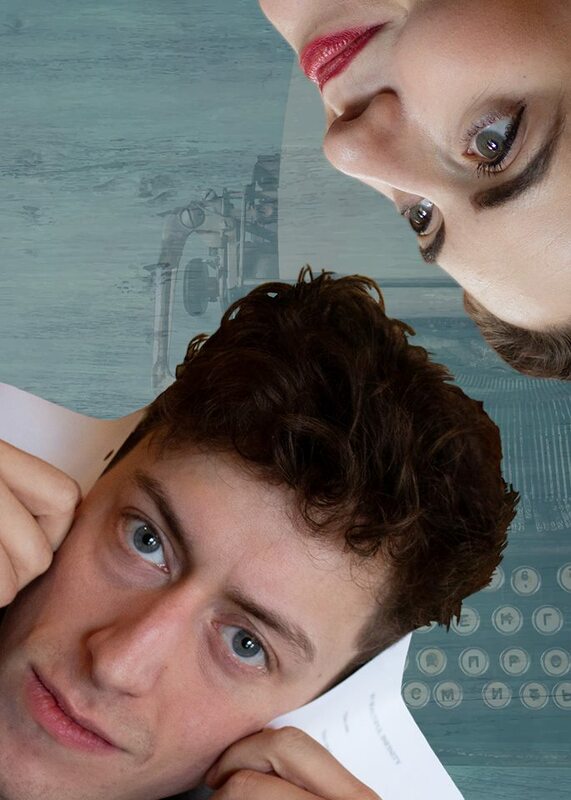 Ariel Leaf and Trevor Keeth are appropriately mysterious and malleable as the other two characters. They all work well together as an ensemble navigating the ins and outs of infinity. I'm glad I took a chance on a new play (all the way down south in Bloomington), and you should too. My Beautiful Infinity is a smart, funny, clever, and totally unique play well executed by the team at Chameleon. Discussions about Euclid, pi, infinity, and cheese - what more do you need?! My Beautiful Infinity continues Thursdays through Sundays through February 17, plus a pay-what-you-can performance tonight (February 4). Click here for info and to purchase tickets for $25 or less.